Should I Use A Unique Hashtag Or Jump On A Trend For My Instagram Campaign? Machine learning is slowly transforming the way we interact with visual content. When you type “beach” in your Google Photos, the Assistant will find and show you all the photos from your summer holidays. But among them, there will be a few images that shouldn’t be there. The fact of the matter is that AI is still not a 100% accurate source for image categorization. That’s why on Instagram, we use hashtags. A pound symbol followed by a word or a phrase is still the most reliable way to easily categorize your photos on Instagram. What’s more, for a brand account hashtags allow you to better engage with your audience and enhance your reach. The main ways brands go about their hashtag use on an Instagram marketing campaign can be boiled down to two. You can either jump on an existing hashtag trend or create your own branded and unique hashtag. Let’s take a look at the benefits and drawbacks of the two options. One of the biggest dreams of every social media marketer is to create a viral hashtag trend. Nevertheless, doing so with a branded hashtag is quite difficult. A great way to engage with your audience, the creation of your own trend requires resource dedication and a dash of creativity to have any chance of success. When doing so, you have complete control and you don’t have to worry about competition. A custom trend is often used as a tool to help your audience share their brand dedication with their peers. It lets people interact with you more easily. What’s more, the hashtag can be used as a call to action or can be directly related to your slogan to further boost engagement. To create a trend, you must invest time and resources into the creation of specific content for that trend. Usually consisting of a few photo shoots, a branded hashtag is often part of a bigger marketing campaign on Instagram and thus requires better planning and strategizing. With a custom trend you can easily get user-generated content. What’s more, you can even push your audience towards creating a specific type of UGC that you think will be beneficial to your overall marketing campaign on Instagram. Plus the reach you receive from the engagement of your audience and the UGC is completely organic. Even one photo from one person means that you’ve reached their peers. The same can’t be said for the use of existing trends. A custom hashtag should do multiple things at once. To have potential, it should be catchy, should fit your brand persona and should describe the message you are trying to send in the shortest way possible. This can be extremely overwhelming and requires a lot of creativity and inspiration. In fact, if you are a brand owner you might hire someone to do it. But if you are a marketer or influencer this is basically your job. Things can get extremely overwhelming when creating a hashtag trend for a brand on Instagram. Pro: You Don’t Have Any Competition! One of the biggest benefits of using a custom hashtag on Instagram is the lack of competition. With a trend you’ve created, you are in complete control and you won’t have to worry about other brands posting under your trend. Quite the opposite in fact, if you create a trend you want people to be using it to achieve better success. If you are not certain about how to go about creating your own custom hashtag trend on Instagram, here are a few tips. Step 1: Send a Message! Your hashtag should have a purpose. Before going and thinking about the hashtag itself, think about the message you want to send. Usually the message should incorporate your marketing goal but should also run outside the spectrum of your business. Once you have a general idea of the message you’d be good to go. Step 2: Think! Get Inspired! Write Down Your Ideas! Don’t settle for the first hashtag that comes to mind. Think about the message you are trying to send across and write down each hashtag idea. Don’t be afraid to create a brainstorming session in the office. Choose the best possible hashtag and run it through a few people from your targeted demographic for feedback. Even if you don’t want to spend a lot of resources on your hashtag, you should plan out a marketing campaign to promote your hashtag. Think about the photos you want to take and about how the audience is going to engage with your hashtag. Don’t forget to review the success of your hashtag on a weekly or monthly basis. Check out the numbers, see how the engagement rate compares to your other posts and make decisions on how you should proceed. A branded hashtag shouldn’t be something you post on one photo to see if it will catch up. Instead, make sure you have the bigger picture in mind and go all in. The more certain you are about the potential of a hashtag, the more resources you should invest in it. Spread it out across multiple marketing campaigns on Instagram. Implement it within the photo itself. Make T-Shirts, mugs or whatever fits your industry the best and create a giveaway. Hire a graffiti artist to create a painting in your office based on the hashtag and take a picture for Instagram. Be creative and don’t hesitate! The second way you can go about when posting a photo or a video on Instagram is to use existing hashtag trends. For an individual the choice is often easy. You simply put in a few trending hashtags and go about your day. And while things might seem similar for a brand account the process is quite different. Hashtags help people who have the same interest share content with each other. By using existing hashtags you will be instantly tapping into a targeted consumer group. What’s more, depending on the hashtags you are using, you have the chance to instantly boost your reach. To properly choose hashtags for the brand account you are managing you need to do a lot of research. 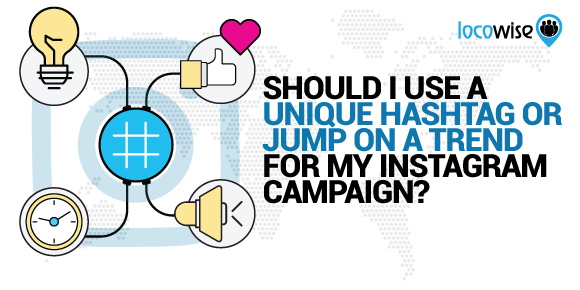 Granted, this action might be performed once every few months but it is crucial for the successful run of the Instagram profile. One of the biggest benefits of using an existing hashtag is the potential to be featured. On the Top Posts, everyone on Instagram searching for a hashtag sees the same results. If you get to be featured the chance for a viral success is that much higher. When running a brand profile on Instagram you should constantly be aware of the stats. Did you know that overuse of hashtags can actually harm your engagement? What’s more, you have to target specific hashtags as using existing trends that don’t correspond to your business might hurt your brand in the long run. Pro: Existing Hashtags do not require a bigger investment! With existing hashtags you don’t have to worry about the overall success of the hashtag itself. The only thing you need to invest is time in research and analysis of the statistics. However, you can use an existing hashtag and never use it again without having to worry about the future success of that trend. Don’t know where to start? Here are a few tips on how to use existing trends on Instagram. Research your audience and your competitors. What are the most common hashtags they use? Make sure to check out the data and see which hashtags work best for your competitors and use that knowledge to your advantage. Choose as many existing hashtag trends as you need. Then plan out your content development strategy in the future. The hashtags might inspire you to do a few posts or you can simply put the most related trends on a post you are about to do. Nevertheless, you should put up a strategy that includes the use of all hashtags you’ve chosen. Step 3: See what works best. After you’ve done multiple posts with the existing hashtags you’ve chosen, take a look at the stats and see what worked best. Keep using the trends that boost your engagement and repeat the process as many times as you like. Tip: Start out with smaller trends! Especially if the profile you are using doesn’t have a big audience, make sure to start out with smaller trends to increase your reach. By using existing trends that don’t have a lot of posts but have views, you boost your chances of being featured in the top posts. And if you think that the stats are overwhelming, make sure to sign up for a free 7-day trial of Locowise! We crunch the numbers for you and let you easily keep track of your brand accounts and get insights on what your competitors are doing! Learn more here!